The year was 1992. The place was Barcelona, Spain. The event was the tower diving competition at the Summer Olympics, held in the hillside community of Montjuic. While I don’t recall the competitors, I do remember being riveted to the TV screen from my home in Calgary wishing that I was there. As the cameras, perched high atop this stunning outdoor diving venue, slowly panned across the city’s expansive skyline, I was completely awestruck with the eclectic mix of centuries-old Gothic cathedrals, modern high-rise apartments, and timeless seafaring vessels docked in the harbor far below. Yes, it was amor a primera vista (love at first sight!) and over 20 years later my affection remains strong for this grand European city. 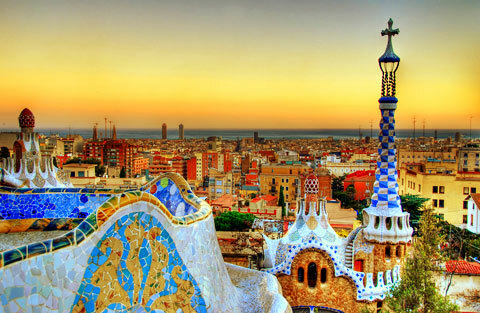 From its panoramic city views to its old world charm that meshes seamlessly with trendy cosmopolitan elements, Barcelona is a “jewel in the sun” to quote a fitting phrase from the rock band Queen. The city is a jewel that continues to shine bright in my memory and is one that I long to see.